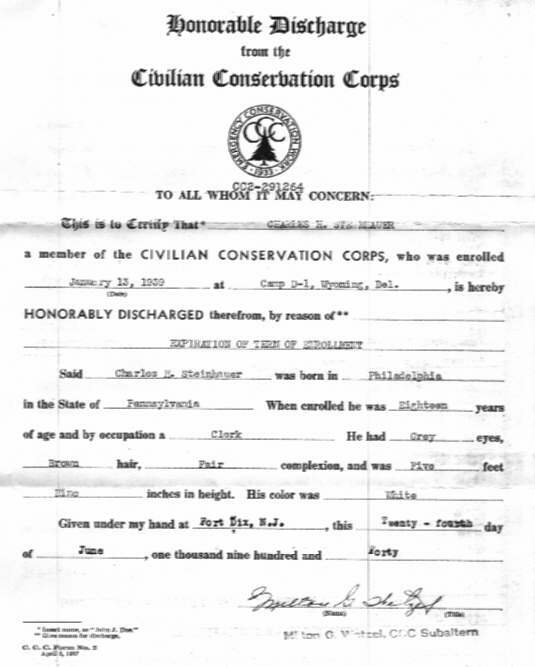 I, Charles H. Stein, joined the CCCs in 1939. 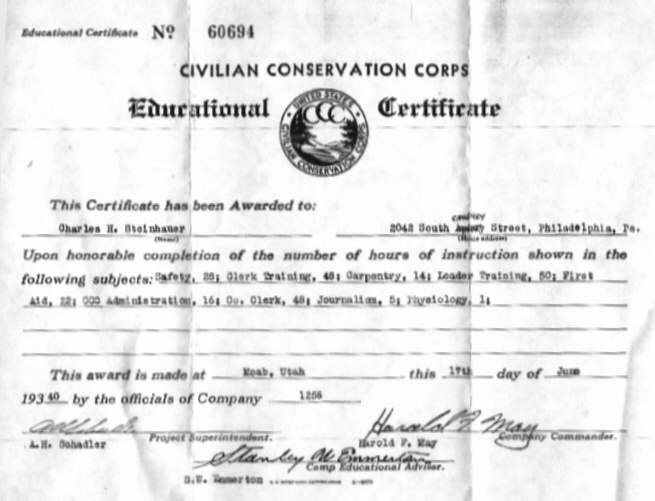 I was living with my grandparents when I enlisted in the CCC. It was the Jacob Deschler farm on Fries Mill Rd across from the Glassboro State woods where their was a CCC camp. They kept German prisoners of war there during the war. My Uncle Bob Deschler and I went to sign up I think it was in Clayton or Woodbury. They did not take Uncle Bob because he was a farmer. Uncle Bob is only 1 1/2 years older than me. I don't remember very much about when I signed up. I think I got a quick exam and was put on the bus to Wyoming. There were a lot of guys signing up there when I did. I was sent to CCC camp in Wyoming, Delaware and was there from January 13, 1939 to July 18, 1939 with Company 3222, in Camp D-1. I have a photo taken there with myself on the right and Harry Peshko, who is now my brother-in-law, on the left of the Company Sign. I had seen Harry Peschko at our hangout occasionally at Wilsons Lake on Clayton and Williamstown Road. I really got to know him in Delaware. After I got out of the CCC I decided to visit Harry in Williamstown. It was then I met his sister. We were married six months later in 1941. The D in our camp name in Delaware was for drainage. Our job was to clean and deepen waterways to prevent flooding. Rocco Terilli was our crew leader from Vineland, NJ. One day we dug up a whole petrified tree. During lunch break in Delaware we would look in the nearby fields for indian artifacts, found a few arrowheads. The camp was comfortable. Although I have been told many of the CCC camps in Delaware were for mosquito control, I don't remember any at Wyoming. I thought the mosquitos were all in New Jersey. I transferred to the 9th Corp area after leaving Company 3222. I was in Monticello and Moab Utah for the rest of 1939 and half of 1940 with Company 1256. Monticello was our summer camp. When winter came we would move to Moab, our winter camp. The company was made up of men from New York and New Jersey. Our company commander there was Major Albert B. Woolumns. I became company clerk on the first day of arrival at Monticello which was July 25, 1939. I became company clerk and assistant leader with 2 stripes in Utah. As company clerk I did all the payroll and the CO's correspondence and filed it. I got this job because the one they had made too many mistakes. I bunked with the Supply Sergeant Joseph Solomon behind the office. 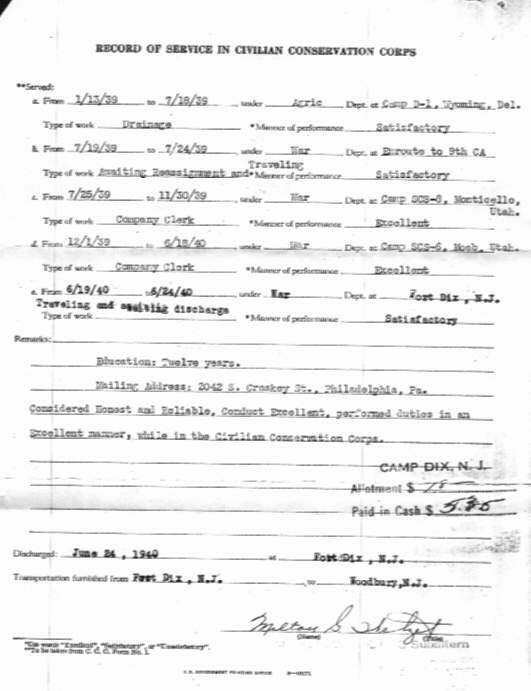 The supply sergeant Joe Solomon was an enrollee leader from Bayonee NJ. I would like to contact Joe Solomon. Some other names I remember are Top Kick Thomas McKenna, of NY, First Aid Kurtz Westville,, NJ, Leader Rudy Rudolph, Westville, NJ, Enrollee Anthony Perillo, Westville or Woodbury. On December 1, 1939 we made the move to Moab. A. H. Schadler was Project Superintendent at Company 1256 at Moab Utah. Harold F. May was our Company Commander when I left. Stanley W. Emmerton was our Camp Education Advisor who handled the classes. One day a couple of rookies thought they were mountain climbers and got stuck half way up a cliff near camp. We secured them at night and it was treacherous because everything became icy. Little did we know then that uranium was all around. On June 18, 1940 my enlistment was over and I left the Camp for transportation home. Six days later I was discharged at Fort Dix, NJ on June 24, 1940. After the CCC disbanded I decided to go to Bayonne to see Joe. When I got to his home his mother said he just went to see you, so I stayed at his house till he got back. Then Joe and Henry Ruth who was the company cook and I went on the town and had a great time. After the CCC I went to work at the Baldwin Locomotive Works as a fitter's helper building locomotives. I was a fitter helper building the shells, fire boxes etc for steam locomotives for the B&O, D&RGW, Pennsy railroads among others. I was transferred to another shop as a fitter putting together army tanks, Shermans, on an assembly line. Then I went to the New York Ship as a Shipfitter. In New York Ship I was a shipfitter who actually put the ship together. Shell, bulkheads, watertight doors. I started in O ways building troop carriers. I think it was six or eight at a time. The crane lifted them right into the water. I then went to the open ways building cruisers converted to air-craft carriers. I then was transferred to the wet dock doing alteration work on these cruisers. During the war everything was rationed such as coffee, sugar, gasoline among other things. We had to go to the municipal building to apply for food stamps and gasoline. We only got a couple gallons of gas a week unless you took riders in your car to work. We had to turn in our toothpaste tube in order to get a new one. After the War I went to Universal Rundle Corp as an inspector, plumbing ware. When they closed their plant in Camden I went to Stellon Mfg Co. as a fitter building all types of pressure vessels. Then Stellar closed down and then I retired at age 63. I'm now 80. I visited the area of Moab and Monticello three years ago and hardly knew it. But the CCC was a wonderful part of my life and I will never forget it and I have many photos to look at.